Direct driven centrifugal fan box with acoustic insulation. 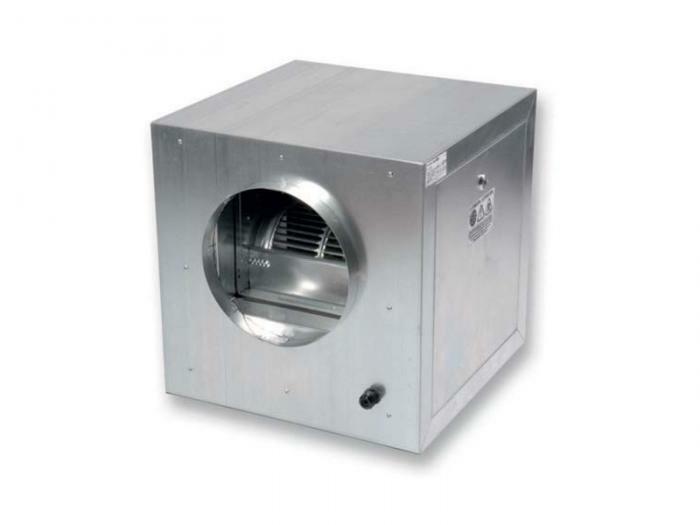 The range consists of 6 sizes and 9 types and covers an air flow range from 900 up to 9600 m³/h. Used for air supply or exhaust of offices, restaurants or shops. Manufactured from fabricated galvanized sheet steel and internally lined with high grade acoustic insulation material. ICF-521 design enables the fan to be accessed from both side panels. A wiring entry grommet is provided on the duct outlet panel to facilitate wiring and installation. Low pressure centrifugal fan with forward curved impeller manufactured from pressed and formed galvanised sheet steel. All impellers are factory fitted to the motors and dynamically balanced to minimise vibration. Protection class IP44, insulation class F.
Supply: 230Vac 1ph or 400Vac 3ph. All models include a Safety Thermal Overload protection device.